How do SunBriteTV's televisions differ from indoor TVs? What are they resistant to? SunBriteTV's products are the only time-tested TVs in the world designed and engineered from the ground up specifically for outdoor use. They are resistant to rain, snow, humidity, salt air, dust, extreme heat, and insect infestations. All SunBrite TVs feature anti-reflective screens and employ video post-processing for increased brightness. So aside from being able to handle the elements year after year, they also deliver a better viewing experience. What changes have you made to the product lineup in the last year? Quite a bit, actually. In April we launched the Signature Series of LCD TVs, which now come in 32-, 46-, 55-, and 65-inch sizes. With one click of the mouse we were able to reduce the price on true outdoor TVs by an average of 40%—which is unprecedented in the video space. The Signature Series now makes outdoor TVs accessible to a whole new range of customers; including both residential consumer and commercial venues. 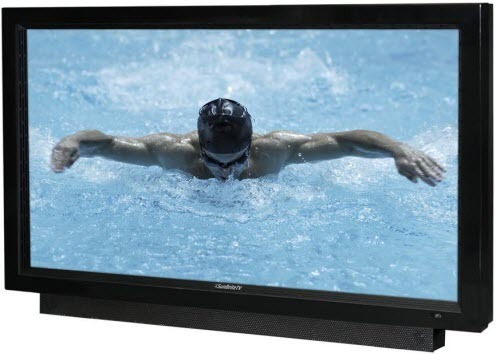 Then in June we launched a product line that custom integrators have dreamed of: true outdoor all-weather flat panel displays that will not go black in direct sunlight. Christened the Marquee Series, all models feature 700 NIT extra bright panels and SunBrite’s proprietary Enhanced Solar Tolerance (EST) technologies, making them direct sunlight-readable. They are available in 47- and 55-inch sizes, and in both landscape and portrait versions. Although they were intended primarily as digital signage solutions for commercial use, we are seeing strong interest from consumers who simply want the “best of the best” for their outdoor living space. SunBriteTV increased production capacity for 2012. What kind of demand are you getting for your products? Yes, coming into this year we ramped up our production capacity by 500%, which gave us the flexibility to expand our product lineup to include the new Signature Series and Marquee Series. Our TVs have received a phenomenal reception in the marketplace, and demand currently still outstrips supply for most of our models. How have your TVs become so popular with consumers and at commercial installations? Our popularity stems from two things. First, we now offer a broad selection of products to suite almost any size application and budget. Second, our products are extremely durable and reliable, and we have built a strong reputation in the industry as the gold standard in outdoor TVs. There are a number of companies that are trying to pass off refabricated indoor TVs as the real deal, and in the end they fail. Custom Installers know that they can install a SunBrite with confidence and the customers will be happy. With commercial installers, our products range from affordable outdoor TVs (Signature Series) for small business owners, to commercial grade vandal-proof TVs (PRO Series), to digital signage models (Marquee Series) that can be used in direct sunlight and can be placed in any outdoor application and weather condition in the world. Why are your TVs so perfect for the custom integration market? Again, first and foremost, the products are extremely durable and reliable. A Custom Integrator’s time is extremely valuable. Having a product that is installed once and lasts for years in a tough outside environment is beneficial. We have also designed the TVs for easy integration with water tight cable entry compartments, easy to clean air filters, as well as a whole host of weather-proof mounting accessories. Are there any specific mounting recommendations with respect to the sun’s position? For the Signature and PRO series models, we recommend that you avoid placing them in a direct angle to the sun. With bright enough light, the LCD crystals could go into temporary blackout. This can be alleviated by using an articulating (swivel-armed) mount and tilting the angle of the screen. However the Marquee Series models can be placed in direct sunlight with no problems. They come equipped with super bright 700NIT LCD screens and SunBriteTV’s proprietary Enhanced Solar Tolerance (EST) technology. What is the operating temperature range of SunBrite TV’s? 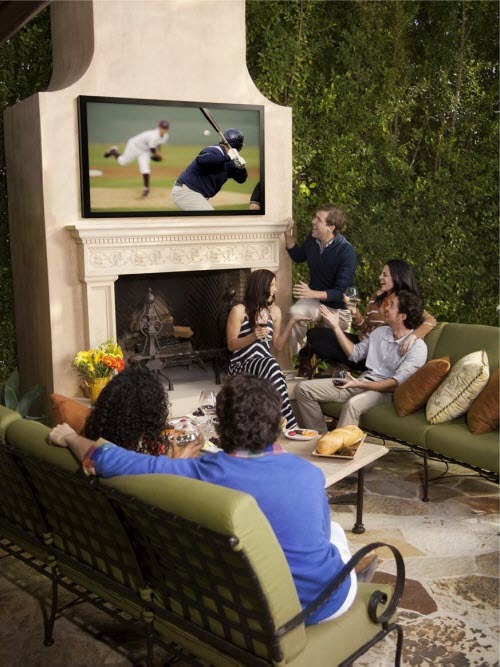 Our all weather outdoor TVs incorporate a multi-fan airflow system that keeps each unit cool and dry. Are there any filters or moisture absorbers that require cleaning or replacement? The special micro-fiber air ventilation filters need to be cleaned periodically. It’s pretty easy to do. Should power be maintained to the TV when not in use? Yes—definitely. The Marquee and PRO Series models actually have built-in heating systems. The TV needs to have constant power, so that the temperature sensors can gauge external temperatures and kick in the heaters in extreme cold. For folks in the northern regions, this could literally save the LCD panel from damage. Should I use an outdoor TV for installation in screened in porch where it is not directly exposed to the weather? Yes– definitely. Screened in porches don’t block moisture in the air. In humid and coastal climates, condensation from moist air and daily temperature swings can wreak havoc on indoor TVs. And even though a TV would be protected from most rain showers, strong storms could easily blow water into a screened in porch. With a SunBriteTV you don’t have to worry about either of these factors. Where is the sweet-spot in your current outdoor TV lineup? Right now the Signature Series as a whole is by far our sweet-spot, with all four models (32”, 46”, 55”, and 65”) experiencing strong sales. It’s interesting that demand for the 65” model (6560HD) is far beyond what we originally estimated. We are seeing consumers migrate towards larger size screens for outdoors. Bigger is better. Why did SunBriteTV choose to manufacture in the US? It was a quality issue. We were not comfortable moving our manufacturing out of the country. Keeping our manufacturing physically in the same building with R & D allows us to make incremental quality improvements—in real time. It also gives us flexibility in production of model assortment and quicker turn-around time to our customers, while keeping jobs here in the U.S. So it’s a win-win for everyone.